This model is essentially the same as the HCS-30, has identical features, but will handle cylinders to 26 feet (7.9 m) in length, 22 inches (558.8 mm) in diameter and provide 40,000 lb-ft (5520 kg-m) of available torque. The HCS-40 will service all current CAT® cylinders. This model is essentially the same as the HCS-30, has identical features, but will handle cylinders to 26 feet (7.9 m) in length, 22 inches (558.8 mm) in diameter and provide 40,000 lb-ft (5520 kg-m) of available torque. The HCS-40 makes disassembling and reassembling hydraulic cylinders easier than ever with its massive 40,000 lb-ft (5520 kg-m) of available torque and built-in High Speed Hydraulic Nut Runner. Rod extraction is a breeze with the 7.5 tons of extraction force. Typically used on large construction equipment and mining equipment, alike, the HCS-40 is the most versatile and economical model in the current Tuxco line of equipment. 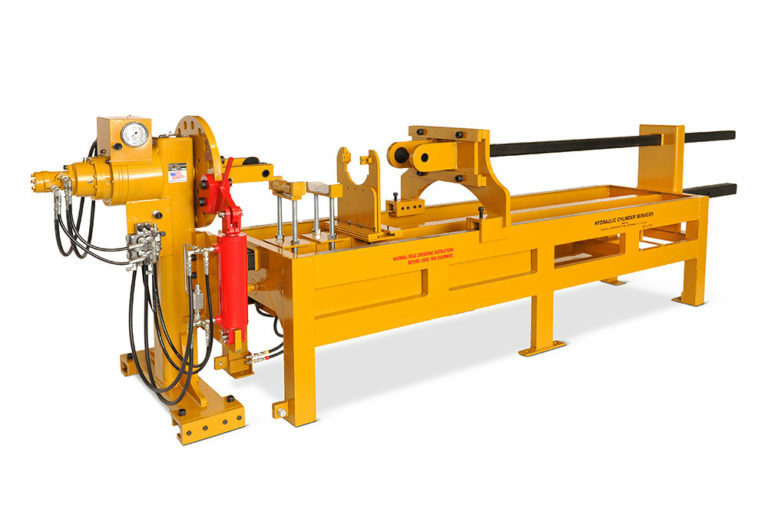 Rest assured with a Tuxco HCS-40 Hydraulic Cylinder Servicer, you will be repairing hydraulic cylinder safer, faster, and more profitably then ever! 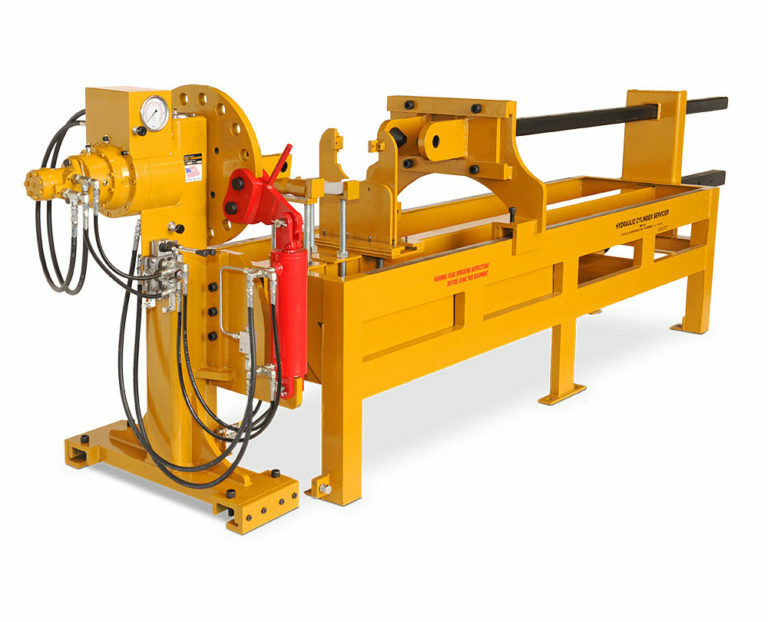 The Tuxco Model HCS-30 Hydraulic Cylinder Servicer includes a double acting torquer cylinder as well as our built-in, high speed hydraulic nut runner to make hydraulic cylinder repair jobs faster, easier, and safer than ever before. This model provides a technician with all of the tools that he needs to quickly repair tough and hard to handle hydraulic cylinders. All of the functions of the HCS-30 are powered by a 5 HP, 3 Phase hydraulic power supply. Low voltage solenoid valves are activated by a six push button pendant control, which allows the operator to position himself in various positions around the servicer at his discretion. At the push of a button, a single operator can generate up to 30,000 lb-ft (4140 kg-m) of torque to loosen threaded glands and piston retaining nuts. Our built-in High Speed Hydraulic Nut Runner then provides 5,000 lb-ft (690 kg-m) of torque at 8 RPM to quickly remove the loosened gland or nut. This model, shown at the beginning of this section, is equipped with a 7 1/2 HP Hydraulic Power Supply that powers seven hydraulic functions that provide maximum productivity and ease of operation. There are two hydraulic torquing devices, one for removing threaded cylinder caps and highly torqued cap bolts (can also be used to remove piston nuts on cylinders too long to fit in Servicer), the other for removing highly torqued piston retaining nuts. The HCS-60 will service all current CAT® cylinders. This model, shown at the beginning of this section, is equipped with a 7 1/2 HP Hydraulic Power Supply that powers seven hydraulic functions that provide maximum productivity and ease of operation. There are two hydraulic torquing devices, one for removing threaded cylinder caps and highly torqued cap bolts (can also be used to remove piston nuts on cylinders too long to fit in Servicer), the other for removing highly torqued piston retaining nuts. A High Torque Hydraulic Nut Runner is also provided. Set up functions are hydraulically assisted. This model is essentially the same as the HCS-60, has identical features, but will handle longer cylinders. Will service all current CAT® cylinders and Hitachi® EX-1800 and EX-3500 Boom Cylinders. The HCS-60-L is equipped with a 7 1/2 HP Hydraulic Power Supply that powers seven hydraulic functions that provide maximum productivity and ease of operation. There are two hydraulic torquing devices, one for removing threaded cylinder caps and highly torqued cap bolts (can also be used to remove piston nuts on cylinders too long to fit in Servicer), the other for removing highly torqued piston retaining nuts. A High Torque Hydraulic Nut Runner is also provided. Set up functions are hydraulically assisted. The HCS-2520 utilizes compressed air to provide hydraulic power and thus requires no electricity to operate. 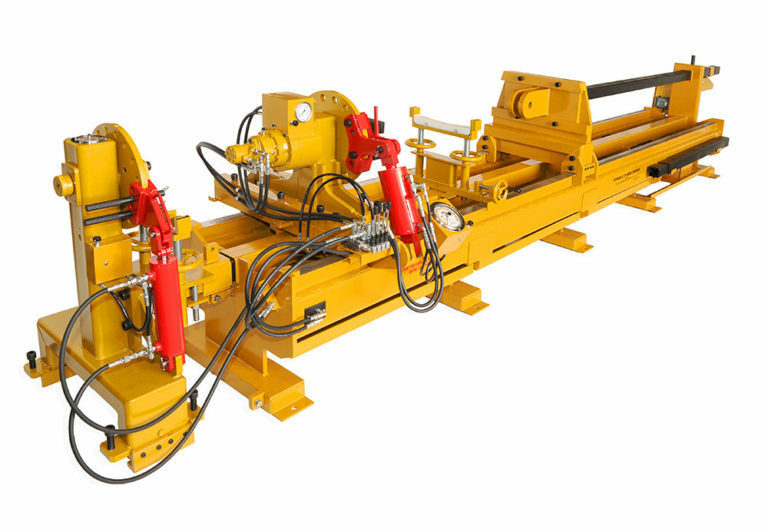 This model is an excellent, low-cost hydraulic cylinder servicer that would prove to be a productive addition to any hydraulic repair facility. The HCS-2520 will produce up to 25,000 lb-ft (3450 kg-m) of torque to remove threaded glands and piston retaining nuts, powered solely by an air/hydraulic system. 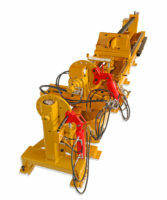 It is designed to service cylinders up to 26 feet (7.9 m) in extended length, with diameters up to 22 inches (558.8 mm). The machine utilizes spring return, single acting hydraulic rams to provide high torque and high rod extraction force. It will service a wide range of cylinder sizes where maximum speed is not a primary concern. This model has proven to be extremely successful in countless installations throughout the world, particularly where 3 phase power is not an option, as well as where volatile atmospheres exist. The HCS-2520 also can be easily mounted on mobile hydraulic repair vehicles, to break down cumbersome cylinders that need to be repaired in the field. This feature alone has made the HCS-2520 ideal for hydraulic repair markets in areas such as the Middle East and Russia/Siberia. 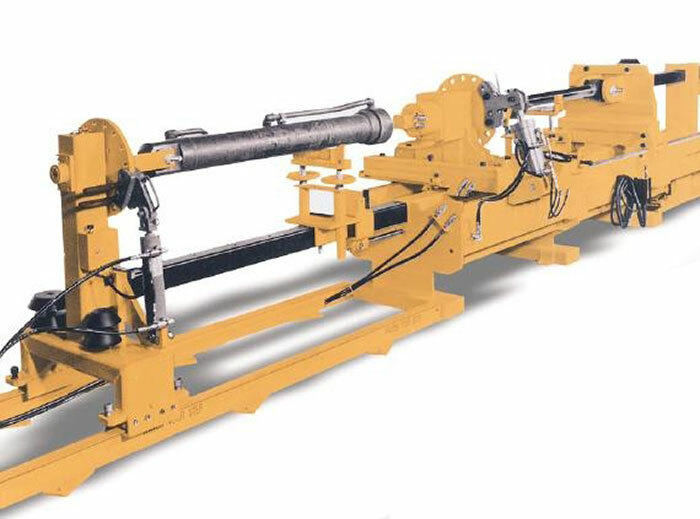 The HCS-25-LS features an electric/hydraulic power supply which allows for faster extraction/insertion of piston rods while repairing and rebuilding hydraulic cylinders. 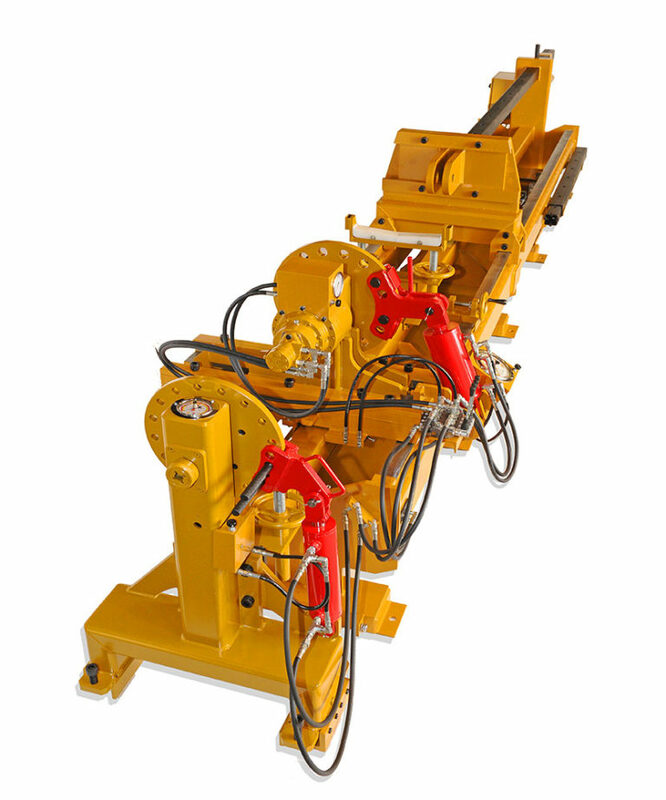 Paired with 25,000 lb-ft (3450 kg-m) of available torque to service threaded glands and piston retaining nuts, this machine will repair more hydraulic cylinders, faster, resulting in higher profits on all of your hydraulic cylinder repair jobs. The HCS-25-LS uses a 2 HP, single phase hydraulic power supply, to operate a 48 inch (1219.2 mm) double acting indexing cylinder. 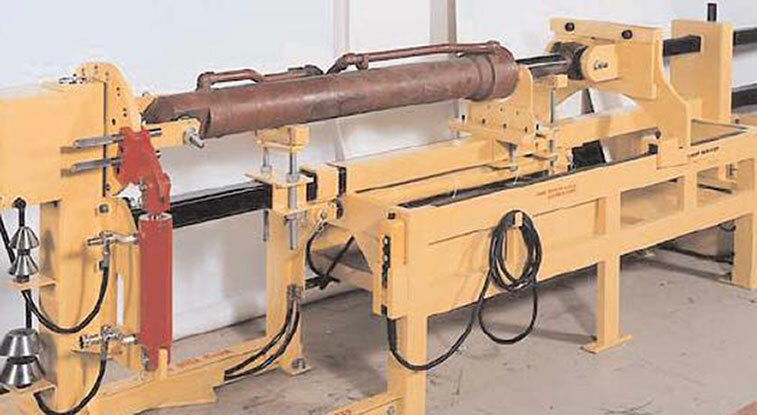 A hydraulic cylinder rod eight feet in length can be removed from a barrel in less than 90 seconds. 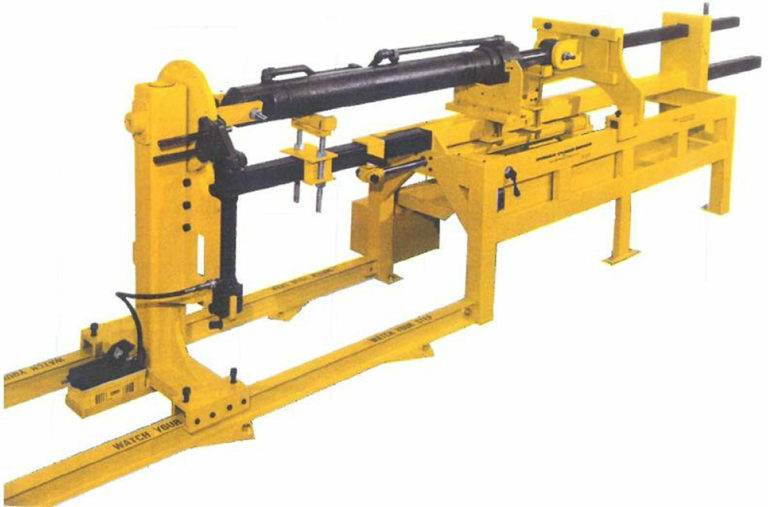 The machine is designed to service hydraulic cylinders to an extended length of 22 feet (6.7 m), with up to a 16 inch (406.4 mm) diameter. 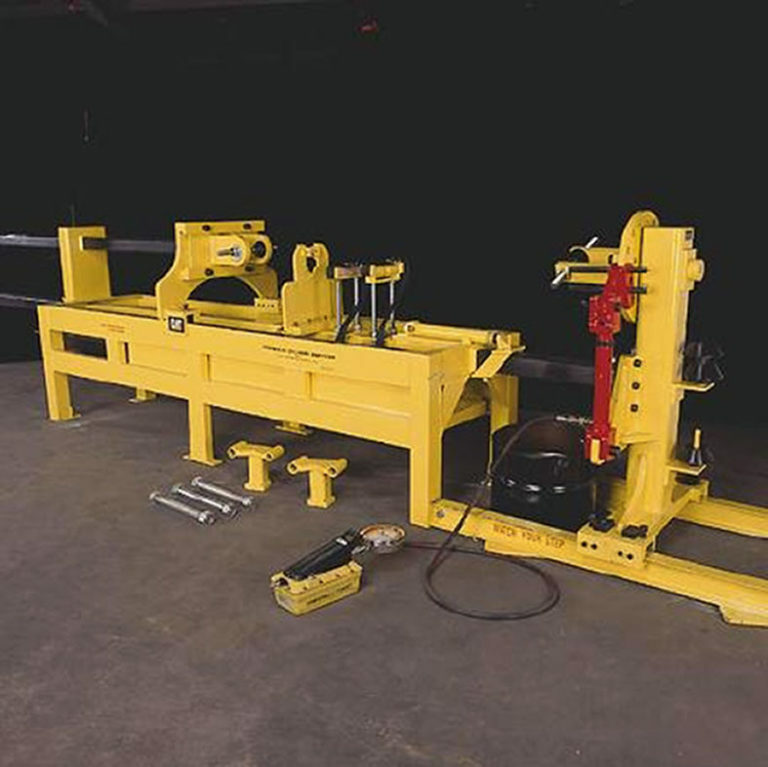 An ideal, entry level hydraulic cylinder repair bench, this model is not only affordable, but offers a fast return on investment. With a HCS-25-LS, repair facilities can count on safer, faster, and more profitable repairs. Hundreds of these models are in daily use by electric utilities, municipal garages, construction companies, equipment rental facilities, and others.